Convergence Wireless, at its core, is a world class wireless networking company that's driven to make a difference for building owners, companies and countries by substantially reducing the amount of energy required to light buildings. 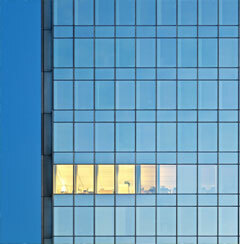 Lighting up buildings consumes a tremendous amount of energy and much of this energy is wasted. The lighting load of commercial buildings has been identified as the single largest segment of U.S. electrical consumption at a nominal rate of 35% based on a study by Lawrence Berkeley National Laboratory. Lighting also has the largest energy consumption increase - estimated at 16% above baseline during peak demand - accounting for an astonishing 51% of all U.S. electricity consumption according to U.S. Department of Energy Director David Rogers. Building owners and utilities continue to spend millions of dollars deploying people to manage energy consumption with manual intervention throughout their facilities. Nothing more sophisticated than phone calls to facilities personnel directing the shutdown of equipment and turning off of lights. This is similar to what occurred in the PC industry where IT managers and CIO's deployed technicians to install software on every computer before network based solutions were available. If 30% of the buildings in the U.S. deployed Convergence Wireless SSL™ it would be the same as taking 93 million cars off the roads from a carbon footprint perspective, according to a U.S. Department of Energy study published by Dr. Francis Rubenstein. With the deployment of Convergence Wireless lighting and energy intelligence solutions, countries can drastically reduce energy consumption in buildings, avoid the need for utilities to fire up expensive “Peaker Plants” during peak demand periods and eliminate the need for constructing new energy production facilities altogether.